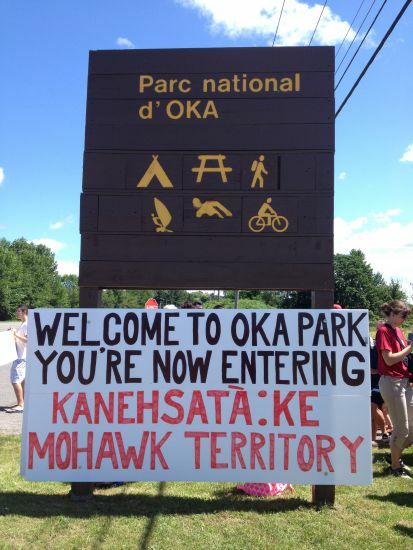 A sign at the entrance to Parc Nationale d’Oka, where Kanien’kehá:ka artifacts are being excavated by archaeologists without community consent. Photo by Ellen Gabriel. I write to you today to bring to your attention the long standing historical land dispute in Kanehsatà:ke Kanien’kehá:ka Territory. Twenty-six years ago our community went through a traumatic experience because of situation whereby colonial racist laws legitimized the land dispossession of the Kanien’kehá:ka of Kanehsatà:ke. Today there emerges a parallel situation in which the theft of Kanien’kehá:ka artefacts from archeological digs in Parc Nationale d’Oka and land development by a private developer supported by the Municipality of Oka is set to take place if treacherous conditions prevail. This situation is exacerbated by the deference of provincial and government agencies to the Mohawk Council of Kanesatake in all forms of decision making processes regarding negotiations on land or regarding the protection of cultural heritage. Government institutions, provincial and federal continue to exclude rights holders such as the Rotinonhseshá:ka – People of the from all forms of negotiations. Most recently I wrote a letter to the Quebec Minister Luc Fortin for the Ministry on Culture and Communications (MCC) regarding archeological digs that have been occurring in Parc Nationale d’Oka (Oka Park) without the consent of the rights holders, the Kanien’kehá:ka of Kanehsatà:ke. I received a response by phone from the director of Direction des politiques et des relations interministérielles. Because of my letter, the MCC decided not to grant a permit to Oka Park for archeological digs for this year. We decided that we would try to meet to discuss how we could work together to protect Kanehsatà:ke’s cultural heritage and after much discussion a meeting was arranged for June 23rd at the Kanehsatà:ke Language and Cultural Center. However, this afternoon June 22, I was informed by the director of Conservation of the MCC that they were cancelling the because they were deferring to the ‘grand-chief’ of the Mohawk Council of Kanesatake (MCK)who they claim would be the one to make a decision on the benefits of the archeological digs. This is not acceptable as it runs contrary to a democratic process and is also contrary to your statement during the elections that Indigenous peoples were a priority as well as the UN Declaration on the Rights of Indigenous Peoples. This was reinforced through a public statement at the UN Permanent Forum on Indigenous Issues on May 9th , 2016 by Justice and the Attorney General Minister Jody Wilson Raybould to fully implement the UNDRIP in Canada. Minister Wilson-Raybould also stated that Canada wishes to shed the shackles of 149 years of colonialism; a statement that seemed promising but has yet to be implemented by all levels of government. Band councils are imposed systems of governance designed to undermine Indigenous traditional governments as well as the role and authority of Indigenous women who in Iroquois customary law, are the title holders to the land. This problem of denying Indigenous rights holders in matters that seriously affect our rights is not of our making and Indigenous peoples should not continually be forced to educate bureaucrats on what our rights are. Nor should we be forced into situations of urgency to protect our lands and cultural heritage when our voices are being constantly silenced by government bureaucrats who consistently defer to band councils. In regards to the last minute cancellation by MCC bureaucrats to wait until the ‘grand chief’ of MCK Mr. Serge Simon makes a decision is not only un-democratic but is also dis- respectful on the part of the Mohawk Council of Kanesatake who did not inform us that they were making arrangements of their own with MCC on this matter. Archeological digs is only one of many issues Kanehsatà:ke is dealing with under an colonial oppressive and undemocratic process of decision making. There is the urbanization plan by the Municipality of Oka to build 400 homes on our traditional territory and which I was informed by a senior policy analyst in AANDC that there is presently ‘discussions’ between the Mayor of Oka and the Mohawk Council of Kanesatake. The community again is not informed of any of these discussions and is another example of the use of a dysfunctional, colonial and undemocratic process designed to continue land dispossession and assimilation. The favoritism towards the band council in any and all negotiations on issues regarding Indigenous peoples land and cultural heritage rights is contrary to the International Covenant on Social, Political and Cultural Rights as well as the UNDRIP regarding our rights to self-determination. Article ll. 2. States shall provide redress through effective mechanisms, which may include restitution, developed in conjunction with indigenous peoples, with respect to their cultural, intellectual, religious and spiritual property taken without their free, prior and informed consent or in violation of their laws, traditions and customs. The community of Kanehsatà:ke has never been dealt with fairly or honestly by the government of Canada and the province of Québec. There has been no resolution to the long standing 300 year old land dispute in Kanehsatà:ke and the attitudes by government institutions is evident that there is no will to resolve them any time soon. No provincial, territorial, municipal nor departments of the government of Canada have the right to choose sides in Indigenous communities of who is ‘legitimate’ or to exclude and silence the voices of rights holders like the Longhouse peoples. Band council represents only ¼ of the community and therefore cannot profess to speak on behalf of the Longhouse peoples. This is practice of double standard by Canada and Québec is unacceptable, intolerable and is causing undo stress and harm to the rights of the community of Kanehsatà:ke. The Rotinonhseshá:ka (People of the Longhouse or Haudenosaunee) are the rights holders and as the Iroquois Confederacy declared, band councils do not have the right to negotiate on issues of land. I therefore ask you to intervene in this matter immediately, put a halt to any land negotiations and place a moratorium on all development on traditional Kanien’kehá:ka lands as we are no closer to resolving the long-standing historical issues in Kanehsatà:ke than we were 26 years ago. As your government’s analysis of Bill S-24 stated, Kanehsatà:ke remains the most problematic land dispute in Canada. I ask respectfully to intervene quickly and to be on the right side of justice and history; please honor your pledge to honor and respect the inherent rights of Indigenous peoples and put an end to colonial oppression that continues to oppress and perpetuate land and cultural heritage dispossession of the Indigenous peoples. The original letter from Ellen Gabriel.